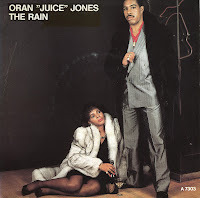 The 12" single of Oran 'Juice' Jones' 'The rain' featured the album version, and as such the longest version that exists of this track. Both sides were taken from his debut album 'Juice', which was a modest success in America but failed to make much of an impression in Europe. After Jones failed to have significant follow-up success, he left the music industry to tend to his terminally ill mother and raise his family. 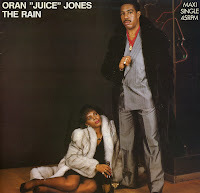 Oran 'Juice' Jones was born in 1959 in Houston, Texas and raised in Harlem, New York. He was the first artist who was signed to OBR Records, a subsidiary of Def Jam. In 1986 he released his debut album 'Juice', which spawned the hit single 'The rain'. This single was promoted with a music video that was based on the album version of the song, even though the single was shortened by two minutes, omitting a speech to a girl who has committed foul play. The single reached number 9 in the BIllboard Hot 100 chart and number 5 in the Dutch Top 40.